Ostensibly Kickstarter was an idea bred from the desire for the audience to have some say into what projects receive the funding needed in order to see the light of day. And it works on that principle, after a fashion. Issues with this idea have cropped up recently now that the platform has matured over the years and achieved a critical mass of projects on the website. One of the primary concerns is how a user who desires to fund a project is supposed to separate the wheat from the chaff and pick out something that would appeal to them. As it turns out, one of the most useful ways to combat this struggle for attention (when you don’t have a large publisher spending advertising money for you) is to have a large enough name attached to your project. Sometimes that can be the publisher, the writer, the director, or (in the case of Battle Chasers: Nightwar) the artist. For many of our readers, the name Joe Madureira may not mean much, but he is someone worth knowing about. Joe Mad (as he’s more commonly known) made a powerful impact on comic book art style during the 1990s and then left that art form to make video games. He has worked on several different games, but the ones he had the most impact on prior to this game were Darksiders and Darksiders 2 (he is not attached to Darksiders 3, currently in production, and it shows). So even from a purely video game perspective, there would be interest in his next project. 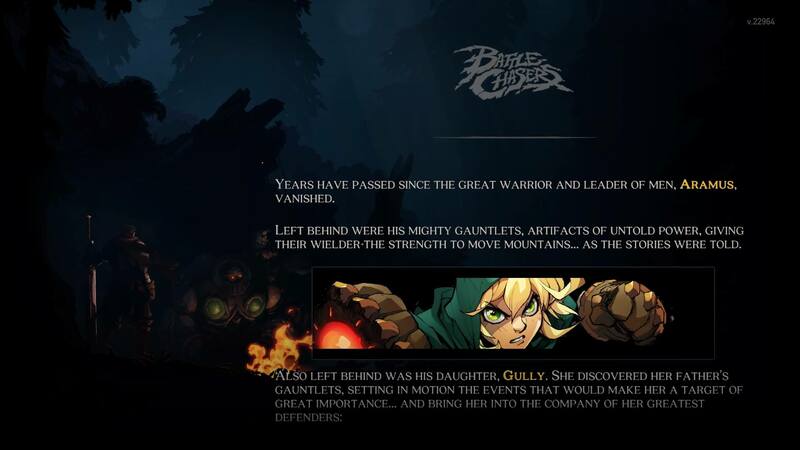 But then he decided to return to the world of Battle Chasers, and that sent many comic book fans into a frenzy, and for good reason. Seeing new animated comics by Joe Mad was a high yield bomb of nostalgia. Joe Mad had worked for Marvel for many years, mostly on the X-Men series of comic books, and he was already starting to get a name for himself. One of his primary innovations was bringing an almost manga aesthetic into the current Marvel style. This was long before you would find manga in anything but a specialty store, so it was quite innovative. After several years as a Marvel inker, he decided to break off and create his own comic book series in a fantasy setting, Battle Chasers. Even with the first issue there was a very noticeable difference between Battle Chasers and the other fantasy offerings we had at the time; Conan, Red Sonja, and ElfQuest. There was a lot of excitement for this book, and you could definitely make the argument that many other comic books were heavily inspired by this series and even video games (before he officially switched mediums). Unfortunately, the series was also plagued by a horrible release schedule. Most of the issues were separated by around 6 months, and the final two were separated by 16 months. I remember quite well Issue #9 coming out in September of 2001, and when I came back from Afghanistan (many months later) finding out that the series had been indefinitely suspended. To say that comic book fans were disappointed by such a short run would be quite the understatement. Even though the Darksiders games were great, there has always been that undercurrent of tentative hope that Joe Mad would finally return to his most beloved creation. 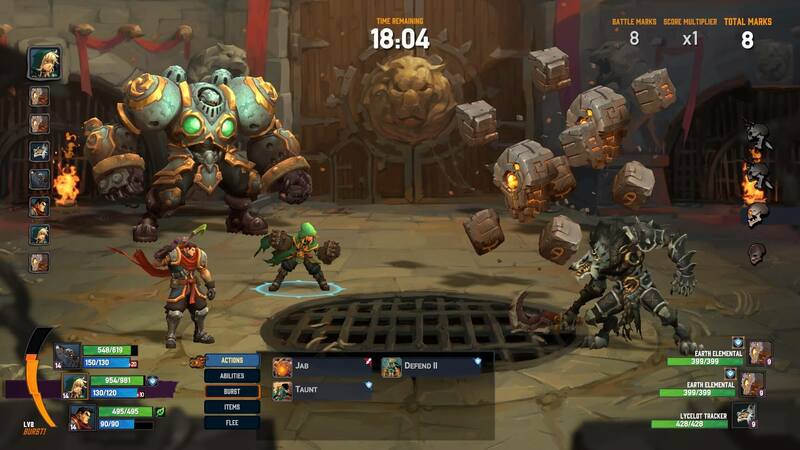 So it’s no surprise that this game was funded on Kickstarter very quickly when it was announced that he would finally return to the world of Battle Chasers. 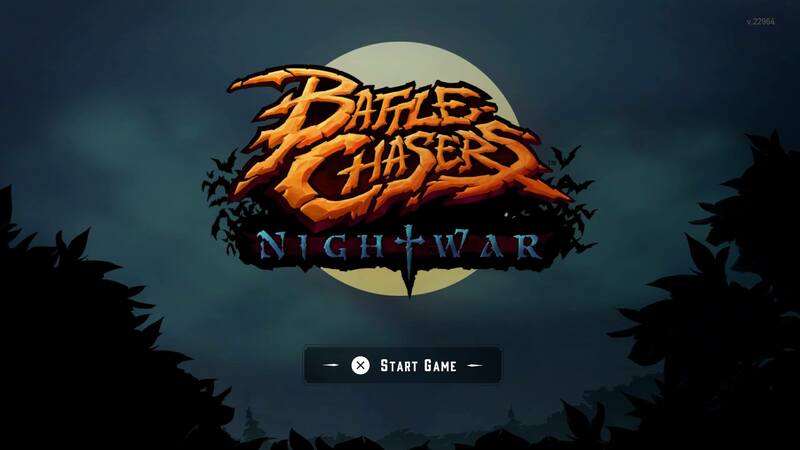 But, instead of the Zelda inspired design of his previous two games, Battle Chasers: Nightwar would be a JRPG. The video game picks up right after issue #9 of the comics, and a short intro will fill you in. The five primary characters from the comic book all return for the game, and they comprise your available party selection. You can use any three of them at a time, but unfortunately those party members not in your active group will not earn any experience. When I initially started reading the series I always thought that Garrison was the main character. He’s a traditional D&D style Fighter with a troubled past that is weighing on him (mostly around the death of his wife). That makes him very talented at what he does, but surly about it 90% of the time. Over time you realize that he’s not really the main character—Gully is. She is the daughter of Aramus, who was Garrison’s mentor as well as being an extremely well known and powerful warrior. Her father vanished, leaving only his powerful artifact combat gloves. Now Gully is using those gloves to aid in the search for her missing father. Garrison feels that it’s his responsibility to look after Gully and train her, like her father did for him. And along with them to help Gully are her two friends, Knolan the powerful Mage and Calibretto the sentient War Golem. Rounding out this ragtag band of adventurers is Red Monika, a mercenary whose plans don’t always align with Gully’s search for her father. She’s a rather mysterious character who has connections to Garrison’s past. A brand new character was added to the series, exclusively in the game. A mysterious new character that was not in any of the comic books features heavily in all the promotional art and the opening video for the game. 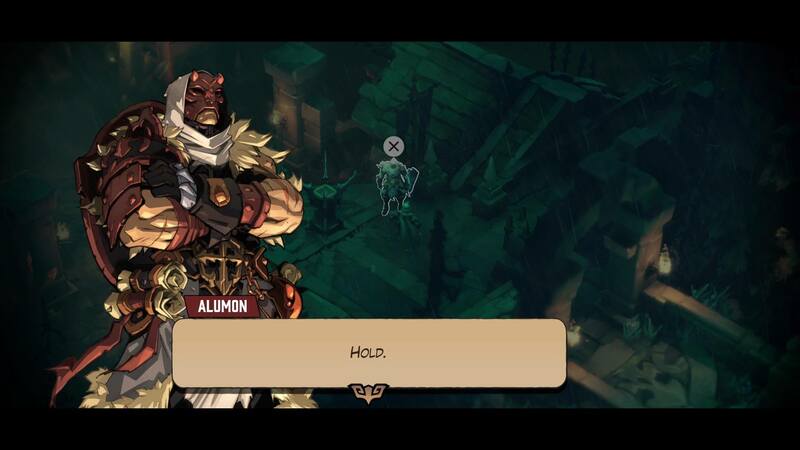 His name is Alumon, and he’s a rather mysterious person that you meet up with about half way through the game. It will be a while before you discover his true motivations, so obviously I will not spoil it here. But I did think it was a little strange when I read that he was a stretch goal for funding. He plays a fairly large role in this local story, so it makes me wonder what they would have done if they didn’t add him as a character. 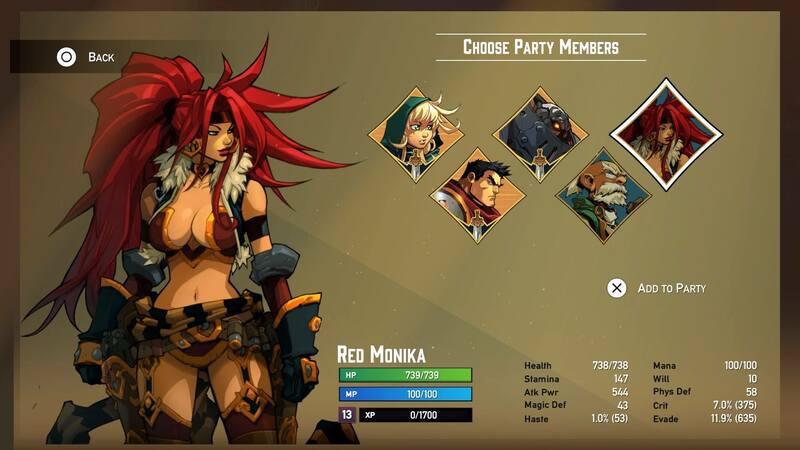 But you will notice right off that you still only have five character slots for available party members, so obviously don’t get too attached to Alumon. But that’s not to say that there aren’t many more new characters that are specific to this game, he’s just the most prominent one. 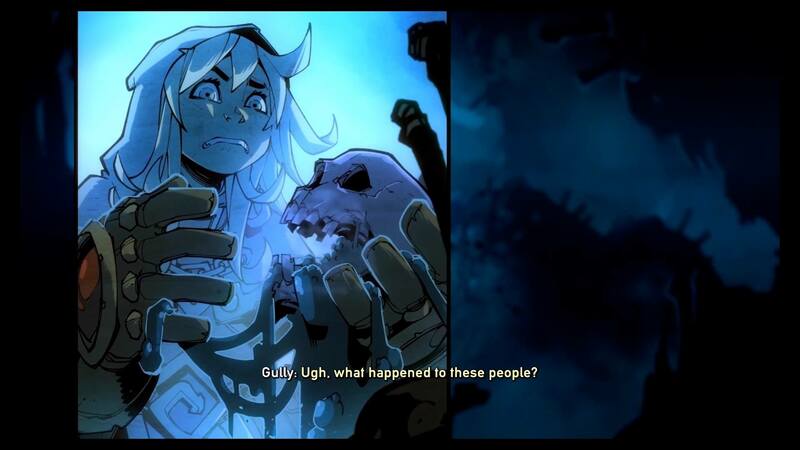 In fact, one of the highlights of Battle Chasers: Nightwar are the various denizens of this island that you find yourself on. Not only are all the characters beautifully rendered in that amazing Joe Mad style, but many of them have some pretty hilarious banter between them and your various party members. This is very old school JRPG design, which works for the game’s benefit most of the time. It was a bit strange that there were five party members but the active party consisted of three. But it ended up working out, you just really should keep Gully in your party at all times (she is the only tank). 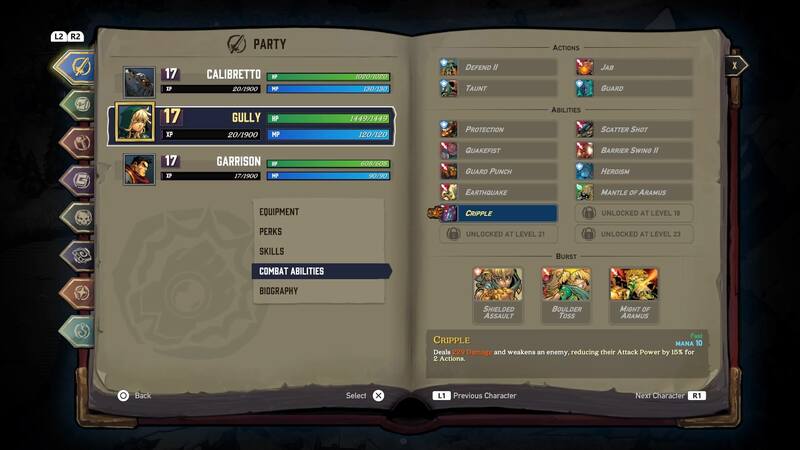 While you can beat the game without a tank in your party, I wouldn’t recommend it. Especially if you are going to be doing the Legendary dungeons, you really do need someone to taunt the enemy attacks off of your squishier characters. Garrison may look tough, but he is a total glass cannon who can dish out a ton of damage but can often be one-shot killed by bosses and large enemies. Red Monika has a slightly different style than Garrison, but by the time she joined my party he was already almost five levels higher than she was. The level disparity was even worse for Calibretto versus Knolan. So I really just kept my first three characters through the whole game. One of the few ways that the very old school design of this game didn’t work for me is the fact that your inactive party members do not earn any experience when you are not using them. In fact, you have to switch to those characters to even equip them with any items you earn as well. Switching party members can only be done as you enter a dungeon or at the inn. So it’s a bit clunky, as RPG systems go, but it is also decidedly old school. So I suspect that those decisions were made to intentionally call back to games of the past. There is no selection of which abilities you learn, as they are automatic at set level intervals. The role and way you play each character is mostly based on their Combat Abilities, which are learned at set level intervals. Initially you only have two Actions and two Abilities. Actions are immediately used as soon as it’s that character’s turn and they do not cost any MP. Most of the Actions (other than the defensive ones) instead perform some action and then also build up Overcharge meter. Overcharge is an interesting mechanic where you can build up bonus MP on top of your maximum during a battle. This allows you to effectively use your Abilities at no cost. All the Abilities use MP and they also require a casting time (displayed above the Mana Cost). There are only a few status effects that can delay an enemy’s action, so you often have to weigh in the cast time heavily before you decide to use an Ability with a long cast time. Sometimes if you don’t get that quick heal in, instead of waiting for that much more powerful heal, the character that you were trying to heal will be dead. So there is actually quite a bit of strategy involved in this game and, even though it is from an indie developer, they managed to balance it quite well. You are still likely to have a dead character every now and then (particularly your glass cannon), but thankfully there isn’t a major punishment for completing the battles with dead party members. As long as one of you survives, the whole party will get the experience and the dead characters will revive with 1 HP. You gain two Perk Points with each level, and you can also receive more from Tomes of Knowledge. Where you can make the characters fit your play style is with the Perks. You gain two Perk Points per level, and you can also find many Tomes of Knowledge throughout the world which will give you additional Perk Points. The minor Tomes allow you to choose one character to give a Perk to, or they may only give one to a specific character. But there are much more rare Tomes that give points to either your currently active party, or your whole group regardless of who’s active. Perks are basically your passive modifiers to your character stats and their abilities. 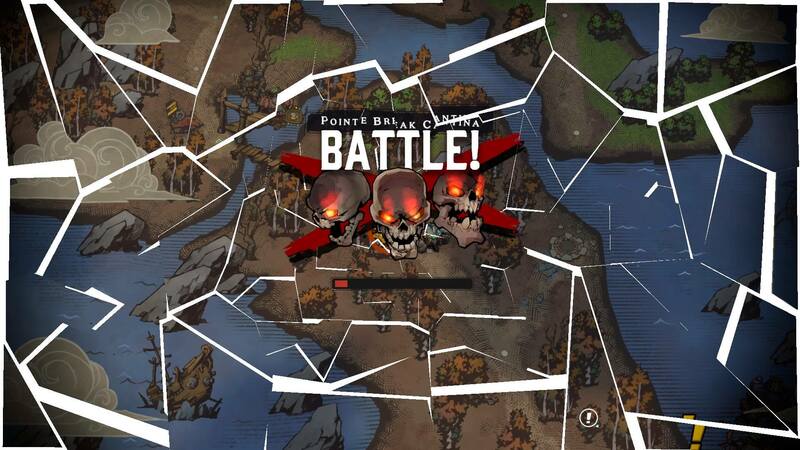 Each character has two skill trees to choose from when investing your Perk Points. You can actually spread them out between both trees to make your character a jack-of-all-trades, but there is a strong disadvantage to doing so. In each Perk tree you also have set bonuses for how many Perk Points you spend in that tree. So if you go all in on Gully’s tank tree (which I strongly recommend you do), she will gain bonus Stamina and Defense after spending a certain amount of points. 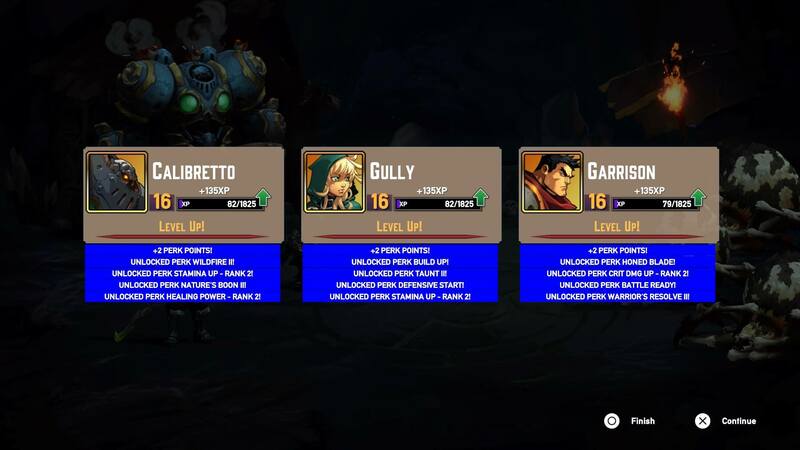 When you gain levels, you also can unlock new tiers within each tree, though not all of them are immediately available (like you see in the above screen shot). Thankfully the most modern thing this game does is allow you to redistribute your Perk Points any time you are outside of combat. So when I unlocked a new set of skills, I would often redistribute my points to make sure I can immediately make use of that next tier of passive modifiers (which are almost always a lot better than anything before them). Your final set bonus in each tree is at 100 points, so there is a lot of room for customization. You can find Tomes of Knowledge all around the world, and can even buy them for a lot of gold, so you could potentially end up completely maxed out, although I did not have the time to do so myself. The higher the risk, the higher the reward. It’s a good idea to go back for Legendary. Tomes of Knowledge, and every other item type in the game, have multiple levels of quality. This game uses the Blizzard system of having increasing quality by color coded names, in order of green, blue, purple, and orange. Because the team making this game was rather small, that does allow them to not need to make art assets for 200 different weapons, but still give you the stat variety that you would want. That being said, there still was quite a bit of variety in the weapons and all of them are actively displayed on the characters while they are in combat. The easiest way to ensure you get the higher quality gear is to tackle the dungeons at higher difficulty levels. Like with the weapon types, the team was able to increase the amount of content by having each dungeon be replayable at multiple difficulty levels and procedurally generated, so there is some variety when you go back. After you defeat each dungeon boss, you are given a Treasure Cache along with any loot that the boss dropped. You can open that for around three-five items that are around the same quality as the chest that you received. Naturally, you will get a higher quality Treasure Cache if you take on the dungeon at a higher difficulty. 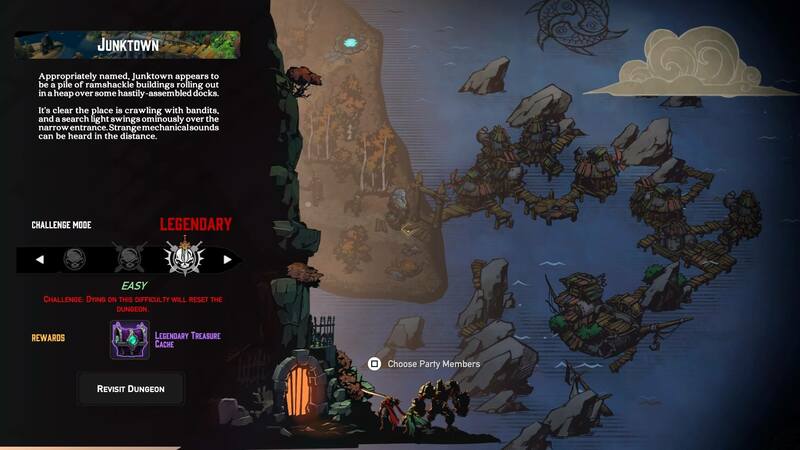 You cannot immediately select Legendary (and you usually would not want to), so you do need to redo every dungeon at least once if you want to get the highest quality loot from it. Not only does the Treasure Cache drop better loot, but most of the creatures in a Legendary dungeon do as well. One disadvantage of this system that people may run into is that the game seems to expect that you are usually going to tackle each dungeon twice, because if you don’t you will find yourself getting behind in levels. So it is optional to replay them, but I would highly recommend it, especially if you are starting to lag behind in levels. Thankfully they have already patched the game to fix some serious issues it had on release. The only major complaint I have for the game has already been stated in the review, that some of the systems are so antiquated that it can get in the way of the fun. It would be nice if there was even more fresh content instead of just replaying the dungeons, but really I do not hold that against such a small indie team. It’s rather impressive that they were even able to put out as much as they did. However, there is a disclaimer that I have to make for this review. If you played this game during its first two weeks of release on PlayStation 4, you might have had a much different experience. I almost had to score this game much lower than I’m going to because the game was a bit of a buggy mess for its first two weeks of life. The first combat you engaged in after entering the game would often take almost a full minute to load, and in general there were really long load times throughout the game, especially entering and exiting dungeons. Another bug was that over 50% of the animated story scenes would not load for me: instead I received a purple screen that I had to hold a button to exit out of. But, most troubling of all, is that the game would completely crash every four hours of gameplay or so. For a good-sized RPG, totally crashing every four hours is a troubling thing. The auto saves generally will prevent too much progress from being lost, but considering the really long load times to even get back in, that was a really frustrating bug. Thankfully, late last week they released the 1.2 patch for this game, and it seems to have fixed all the problems I was having with it. So that’s why this paragraph is a disclaimer to those who had played it early, and will not drastically affect the review score. The Battle Arena is entirely optional, but it has some of the best rewards in the game. Thankfully now that the bugs have been fixed I can easily recommend this game, especially for fans of Joe Mad or JRPG fans. This is a really solid game with some good voice acting and really good fantasy styled music (reminiscent of The Witcher series, for many songs). Obviously none of the sound and voice work can compare to Joe’s art designs, but that would be an almost impossible task for even a major developer. Some people have complained about how over the top Joe is with his character designs, and there are the usual complaints from certain quarters about how he dresses his female characters. However, you just don’t find games with such eye popping characters very often, and being able to make the 3D models look like beautiful 2D drawings is quite the difficult task. This tiny developer has succeeded at their goal of reinvigorating this long gestating franchise and turning it into a really solid game. If you just focus on the story, and only re-enter dungeons when you really need to catch up in levels, you could finish this game in around 30 hours. But for me, I prefer to see as much as possible, and if you are a bit of completionist you can easily spend over 40 hours without even maxing out all five of your characters. That is a lot of game for $29.99, and that also means that this game is a success both by receiving its funding, and also by giving backers and fans exactly what they wanted. Some people have been turned off by Kickstarter recently, but games like this remain great examples of why it’s still a necessary component of our modern gaming industry.